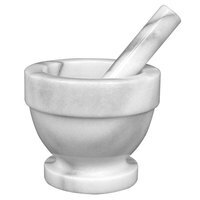 A mortar and pestle set is an essential device for crushing, grinding, and blending ingredients that add zest to your dishes! 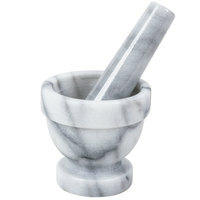 The weighty marble or granite composition of each mortar and pestle provides a time-tested method of rendering herbs and spices for food preparation. 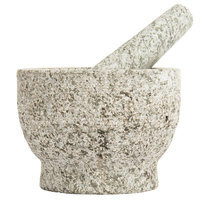 Place whole seeds and spices in the mortar, and let the weight of the pestle help you grind ingredients into find powders or smooth pastes. 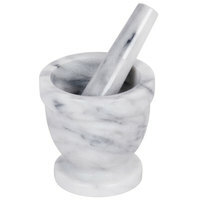 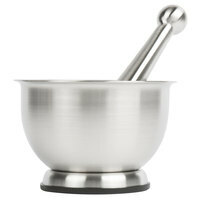 Different mortar and pestle set size options are available to suit your kitchen's needs. 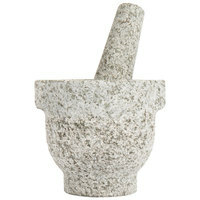 We offer sets in a range of heights and widths, including tiny items for grinding very small amounts of spices and bigger products for blending many whole and large ingredients. 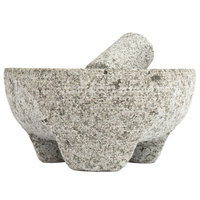 You can choose from a white marble mortar and pestle with fine black lines or a speckled granite option, depending on your needs and style preference.